GodTools can help any time, any place, and in multiple languages on your mobile device. 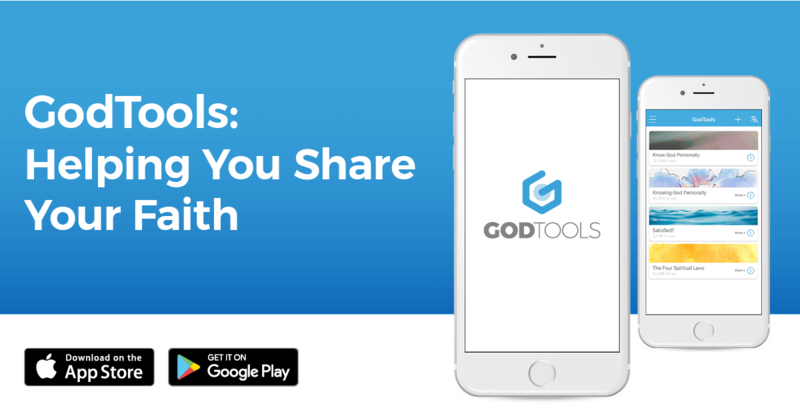 GodTools equips you to confidently talk with others about how they can begin and grow their relationship with God…even if you’ve never shared your faith before. Included in the app are a variety of visually engaging tools that help you share your faith in any setting. Each presentation is available in 60+ languages and has been translated by local native speakers. With the toggle button you can easily switch between your heart language and theirs. Looking for answers to big questions? It is your journey to discover, so explore what God, faith and Christianity are all about through this easy-to-use app, available on your mobile device. Read the Bible whenever you want, wherever you are. One of the most compelling ways for someone to meet Jesus is to see him and hear him in your own language. A multilingual library of digital films and video clips on faith and life, searchable by country, language (more than 1500) and film, is available through the Jesus Film Project App. This app provides free, simple and quick access to this resource library of more than 200 full-length films, allowing anyone, anywhere in the world to see, hear and encounter the story of Jesus–his life and message–in the language of their heart.